Secular songs, poems and texts devoid of a Christian content banned. If family members or others wish to speak about the deceased this can be done at the graveside or when the family and friends gather after the burial. * Appreciations or eulogies by family members or friends of the deceased should not take place in the Church but may take place after the Rite of Committal in the cemetery or when the family and friends gather. * The ambo is for the proclamation of the Word of God. * Readings at the Funeral Liturgy should be taken from the Lectionary. * Secular songs, poems and texts devoid of a Christian content are out of place in the Funeral Liturgy. * A post-Communion reflection of a prayerful nature can be given after Communion but this should be agreed beforehand with the Celebrant and should not be used as a cloak for a eulogy. * As is clear from the directives on the Funeral Rite, the deceased should not be canonised in the homily. * If a visiting priest is officiating at the Funeral Mass he should be informed of these regulations and asked to abide by them. * It is important that undertakers in your area are aware of these regulations. It is also important that clear arrangements are in place on the signing of books of condolence. Some priests expressed the view that they should not be allowed in the Church. * Clear arrangements, allowing people the opportunity to offer sympathy to the family of the deceased, should be put in place in each parish. * In some places it seems that the ‘funeral planner’ has made an appearance. 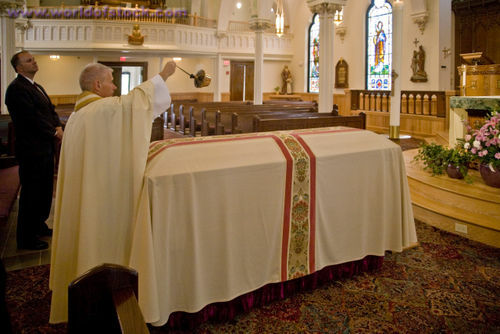 Priests should only engage with the family in relation to the Funeral Rite. Referring to the book ‘Eschatology: Death and Eternal Life’ by the then Cardinal Ratzinger, Bishop Smith notes that the Pope Emeritus quotes, with approval, a phrase of the theologian Joseph Pieper who summed up the modern approach to death as “the materialistic trivialisation of death”. Cardinal Ratzinger, in this context, goes on to write ‘Death is to be deprived of its character as a place where the metaphysical breaks through. Death is rendered banal so as to quell the unsettling questions that arise from it’, Bishop Smith noted. 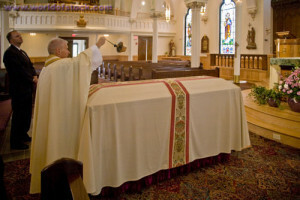 “The funeral liturgy in its prayers and readings has a very clear and intended focus. It is a prayer of petition for the deceased, a prayer commending the deceased to God’s tender mercy and compassion, a prayer rooted in the hope engendered by the Death and Resurrection of Christ,” Dr Smith suggests.